Land of stone and sun! Infinitely charming! Land of stone and sun! Sparing! Treeless! But infinitely charming! Mani! 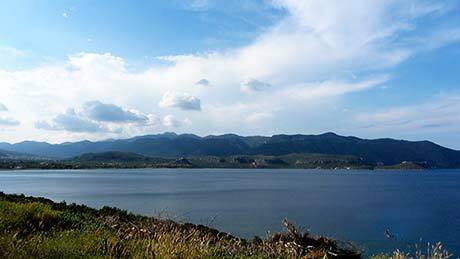 In the southwestern edge of the Peloponnese! Landscapes carved in stone by the winds; hard and yet attractive! Mountainous landscapes over gorgeous bays. Small settlements nominated the most traditional; towers of unique folk architecture; countless old Byzantine churches, of folk architecture, too; caves wonders of nature, shelters during the Neolithic era; prickly pears in the dry soil and small olive trees, giving famous oil. And people tough and frugal, with deep roots in traditions and customs, pride and hospitable. Historical and traditional! Imposing! Never conquered! Unique in every step of the visitor! In its northeast corner is Gythio. A charming sea town with a long history; harbor and center of a region with endless beaches and great tourist services! 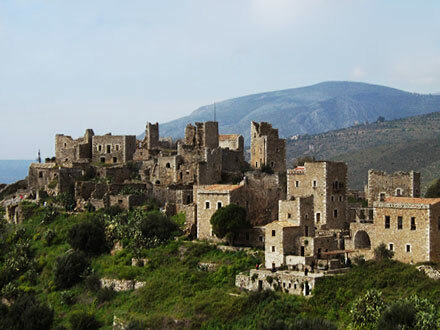 The historic region of Mani is located in southwest Peloponnese. 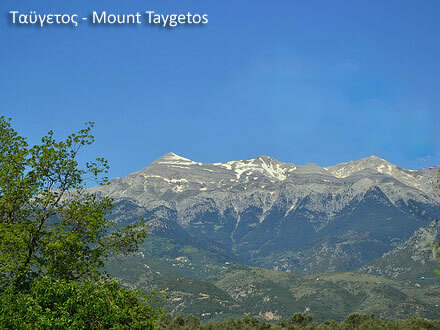 It spreads in the mountain Taygetos and in the peninsula between the Messinian Gulf in the west and the Gulf of Laconia in the east. One part is in Laconia and one part in Messinia. The northern boundary is an imaginary line from the settlement Kardamyli at the coast of the Messinian Gulf up to the ridge of Mount Taygetos. The southern boundary is Cape Taenaron, the southernmost point of mainland Greece and the peninsula of Balkans. The northern section, located in Messinia, includes a part of Mount Taygetos and the coastal zone from Kardamyli to just below the village of Agios Nikon or Poliana and is called Exo (Outer) Mani or Messiniaki (Messinian) Mani. 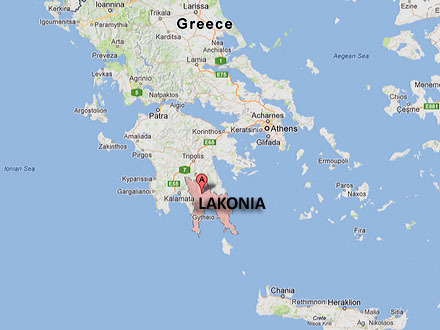 The southern part, located in Laconia, is named Messa (Inner) Mani or Lakoniki (Lakonean) Mani. The western part to the Messinian Gulf is also called Aposkiaderi (to the shadow) Mani and the eastern part to the Gulf of Laconia Prossiliaki (sunward) Mani. The peninsula of Mani is crossed by the mountain Sangias or Kato (Lower) Taygetos, also called Mountain of Mani. Sangias is a continuation of Taygetos. It begins after the neck formed between Gythio and Areopoli and reaches the southern tip, dividing the peninsula into eastern and western. The mountain range has a length of 30 km and the highest peak is at 1,218 m. The terrain is rugged, barren and treeless. The highest zone has no vegetation. Lower down there is low vegetation. On the east coast, south of Gythio, the slopes fall steeply in the Gulf of Laconia, where some bays are formed, mainly north and south. On the west coast, south of Areopolis, is formed the ίσιωμα (issioma – level), a low “platform” with limestone composition, which drains the water in the Messinian Gulf mainly through underground formations; so the land barren and dry ends abruptly at sea. Eroded in this way, the west coast forms bays, and is full of caves. 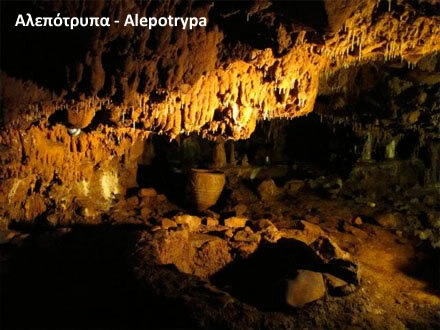 Among them are the famous caves of Dyros - Vlychada, Alepotrypa and Katafigi. Besides history and traditions, Mani attracts visitors with its peculiar environment and folk architecture; unique folk architecture reflected in the villages, towers and churches. Many villages have been declared preserved traditional settlements; coastal villages and small ports in the background of picturesque bays or almost deserted villages in the mountainous interior. Many towers and churches have been declared protected historic monuments. Towers and tower-houses are a main feature of Mani; is the result of historical and social evolution of the region. They are about eight hundred and everywhere. In some villages there are many; mostly in Kita, Nomia and Vathia. Other towers constitute a whole with the dwelling, and others are the part of the fortification. They are built of stone. Until the 18th century were built with stone walls without mortar. They have dimensions 4x4 m in the plan view, four or five floors and a height up to 20 m. At the sides are small openings; the loopholes. After the Greek Revolution of 1821 larger towers with more openings began to be built. Their construction continued until the end of the 19th century. Most churches are small; also everywhere. 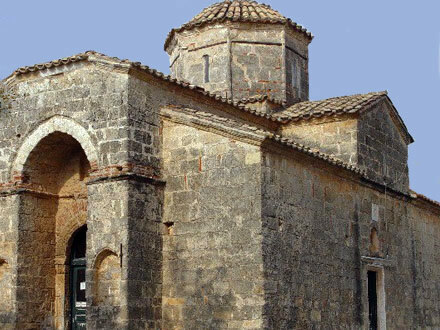 There are many Early Christian churches from the 5th to 6th century and numerous one room churches from the 11th century onwards. They are built of large stones without mortar. Many look like constructions of prehistoric era. Hard and dry soil, stone and rocks, bare landscapes, tall coasts! A land difficult to be inhabited and even more difficult to be conquered! The people who inhabited this land were also tough. The peninsula was never conquered. Mani remained for centuries away from foreign influences, a closed society, with its own customs and its own culture. You feel it by crossing the place, especially the peninsula. 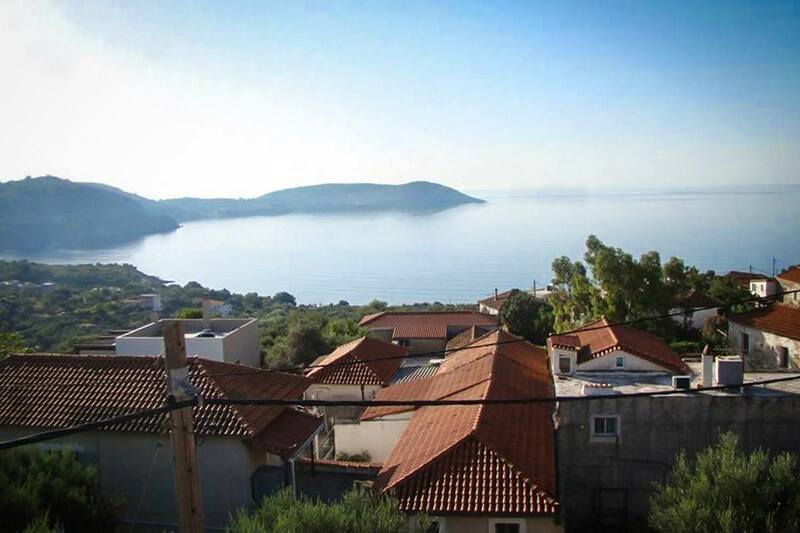 In Mani there are traces of human presence from the Paleolithic era. Found in Alepotrypa, one of the Dyros caves, and in some other coastal caves. In Alepotrypa the archaeological research also brought to light important finds from the Neolithic era (4500 - 2700 BC). At various points were identified settlements from the Mycenaean era. Homer mentions cities of the region such as Messe and Itylon. After the predominance of Dorian, Mani followed the history of Sparta. During the Roman era, the evolution of the area was connected with the autonomy and development of the coastal cities of Laconia, which founded the League of Eleftherolakonon (Free Laconians). During the first centuries of the Byzantine era, the defense was strengthened. In the 9th century a section in the south was a separate administration with the castle of Maini as the center. Initially the name related to a limited extent. It was mentioned for the first time by Emperor Leon VI the Wise (886 - 912) for the seat of the bishop of Maini. With the reorganization of the Byzantine provinces the entire peninsula came to the Thema (Region) of the Peloponnese and was called Maini or Mani. Most likely the name comes from the adjective "Manos" which means "sparse"; "Mani country", that is "sparse land." Evidently was related to the dry and treeless environment. However, the name "Mani" is already used since the Ottoman era. During the Frankish rule the area was in 1249 for a few years to the Franks and became one of the twelve baronies of the Principality of Moreas. The Franks built the castles of Passava, Gisterna (Beaufort) and Great Maini. 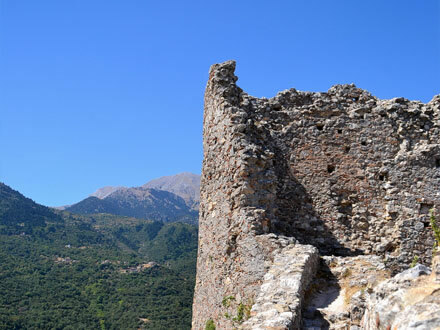 In 1262 after their defeat in Pelagonia the Franks surrendered the castles of Maini, Mystras and Monemvasia to the Byzantines. Over the next two centuries, Mani was included into the Despotate of Moreas without ceasing to be rebellious. In 1460 the Turks completed the conquest of the Peloponnese conquering Mystras. Many families left the castle and fled to Mani. The Maniots however resisted effectively. Mani has not subjugated. Revolted often, acquired special privileges such as internal autonomy and firearms license, with an annual tax in return. When in 1669 the Turks took Crete from the Venetians, many Cretan families came to Mani and established their own settlements. Refugees from other areas came, too. 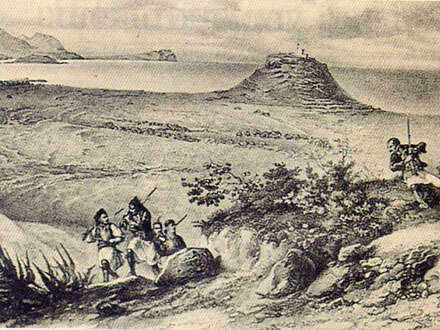 At the same time the Turks with 6,000 men repaired the castles of Kelefas and Itylo. In the late 17th century, Mani had one hundred villages and 40,000 people, a large number thinking the barren and rocky area. From 1673 until 1676, many inhabitants fled to Italy – Livorno, Taranto, Naples and Corsica. Population growth has created the need for vital space and brought conflicts. The military readiness became a way of life and armed groups with blood relationship, living in fortified installations around the patrimonial hearth, prevailed as a peculiar social and economic organization. The construction of towers was one of the results of this process. Alongside, due to its strategic position, the peninsula was at the center of international interest at the time. The Western powers were seeking mercenaries to the experienced in war Maniots and piracy flourished. After the Greek revolt in 1770 at the time of the Russo-Turkish war (1768-1774), in 1776 the Turks ceded semi-autonomy in the region by appointing Maniat-Bey from the powerful captains of Mani. Eight beys governed Mani until the Greek Revolution in 1821. Great was the heyday of the region under Tzannetbey Grigorakis, who ruled from 1782 until 1797. The Turkish garrison of the castle of Passava exterminated, the northeastern Mani extended, fortifications were built, Gythio reborn, commerce grew and the preparation for the liberation struggle of Greece began. Petrombey Mavromichalis, the last bey of Mani, was one of the leaders of the liberation struggle. On March 17, 1821 he declared the Revolution. Brave men and ready for war the Maniots offered the maximum in the Struggle, but after the independence were hardly assimilated in the Greek state. During the reign of Otto they resisted to the Bavarians. After 1870, despite occasional troubles, peace gradually prevailed. The local autonomy decreased, the economic life changed, and the place began to be deserted by immigration. Wherever they went, however, those who fled, kept their habits and traditions, like those who stayed.